Are flexible frameworks the solution? America is in the midst of a revolution: the shale gas revolution. The supply of shale gas, a source of natural gas locked inside shale rocks, is growing exponentially and has the potential to revolutionize the energy landscape in the United States. To take advantage of this opportunity, we must develop technologies that can effectively and economically process natural gas. Scientists at the Center for Gas Separations Relevant to Clean Energy Technologies (CGS) Energy Frontier Research Center are working on separations that can be applied to natural gas processing. Efficient separations are an integral part of natural gas processing. To be used as pipeline-quality natural gas, we must remove impurities such as water and carbon dioxide, from raw natural gas. The most useful separators have high selectivity (the ratio of the desired component’s throughput to that of an undesired component) and low energy requirement, as energy consumption can be prohibitively high for large-scale processes. Researchers have an opportunity to design novel materials to perform critical separation processes. To appreciate the importance of this, consider pasta noodles. Just like molecules, pasta comes in different sizes and shapes: spaghetti, penne, orzo, gnocchi, etc. What would happen if we lived in a world where all these noodles came stuck together? To make our favorite dishes, we'd need to separate the noodles from one another. Inventing a special pasta strainer that could effectively remove the undesired pasta would be a boon for humanity in this scenario. Similarly, scientists at CGS have synthesized metal-organic frameworks (MOFs) to separate carbon dioxide from methane. These frameworks are porous materials consisting of metal ions bridged by linker molecules. The pores in MOFs can be designed to have specific sizes and shapes, allowing them to filter molecules of similar size. Scientists at CGS have developed a flexible MOF, which they observed could expand in response to gas pressure (that is, the concentration of gas) to accommodate gas molecules. They observed that this material appeared to be highly selective for carbon dioxide: negligible amounts of methane are adsorbed at low pressures but orders of magnitude higher amounts of carbon dioxide in the same pressure range. While the material is selective for carbon dioxide, that is not the end of the story. There was another critical component that had to be investigated. The CGS researchers’ initial tests were single component studies. This means that they exposed the material to only one gas at a time. While experimentally convenient, it’s difficult to determine how meaningful these results are. From a practical perspective, single component tests are a departure from reality where a mixture of gases must be processed and separated. On a fundamental level, carbon dioxide could expand the flexible MOF to also allow methane to pass through the pores, leading to appreciable methane adsorption and reducing the selectivity. The scientists went back into the laboratory to investigate a mixture of gases. They found a remarkable result: the material maintains its near-perfect selectivity when exposed to 50:50 mixtures of the two gases. 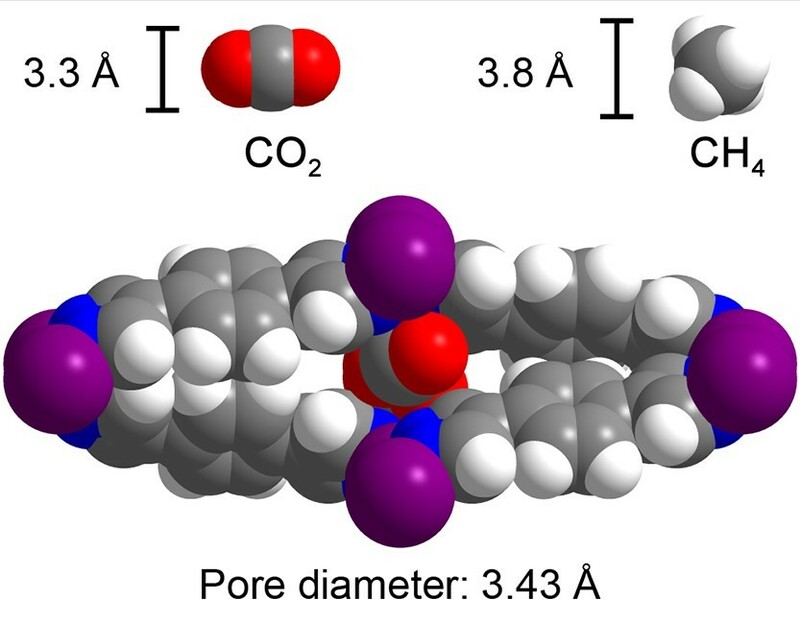 At low pressures, they discovered that the material stretches just enough to accommodate carbon dioxide molecules but not enough to uptake methane molecules (see the figure). As increasing gas pressure causes the MOF to expand further, it continues to completely exclude methane in favor of carbon dioxide adsorption, which the researchers hypothesize is due to favorable interactions for carbon dioxide binding. The flexible MOF did allow some methane into the pores when exposed to a gas mixture dominated by methane, although it still showed a high selectivity for carbon dioxide. Through these findings, the CGS team has gained unprecedented understanding regarding both the selectivity of flexible MOFs under mixed gas conditions and how the separation mechanism works. The work also has significant practical implications. The material can remove carbon dioxide from methane under industrially relevant conditions and could serve as a breakthrough in natural gas processing. These findings could be extended to design tailored materials, with different structures, to capture specific molecules of interest for many applications. The outlook of applying flexible MOFs to perform separations in a way that requires less energy is promising. Perhaps then, perfect separations will be coming soon to a store near you. This work was supported as part of the Center for Gas Separations Relevant to Clean Energy Technologies, an Energy Frontier Research Center supported by the U.S. Department of Energy, Office of Science, Basic Energy Sciences. Rahul Sujanani is a Ph.D. candidate in chemical engineering at the University of Texas at Austin. He is a member of the Center for Materials for Water and Energy Systems (M-WET) Energy Frontier Research Center and is advised by M-WET’s director, Benny D. Freeman. His research focuses on ion and water transport through novel polymer membranes for water, energy, and resource recovery applications. As the shale gas revolution continues, it’s imperative to have better ways to purify the natural gas obtained from inside shale rocks. It's challenging to take out the carbon dioxide molecules. At the Center for Gas Separations Relevant to Clean Energy Technologies (CGS) Energy Frontier Research Center, scientists looked into a promising class of materials called metal-organic frameworks (MOFs). The team discovered how a flexible or sponge-like framework they developed works with near-perfect selectivity. It traps what it should. And it does so under industrially relevant conditions. The framework stretches just enough to remove the carbon dioxide, while keeping out the natural gas. 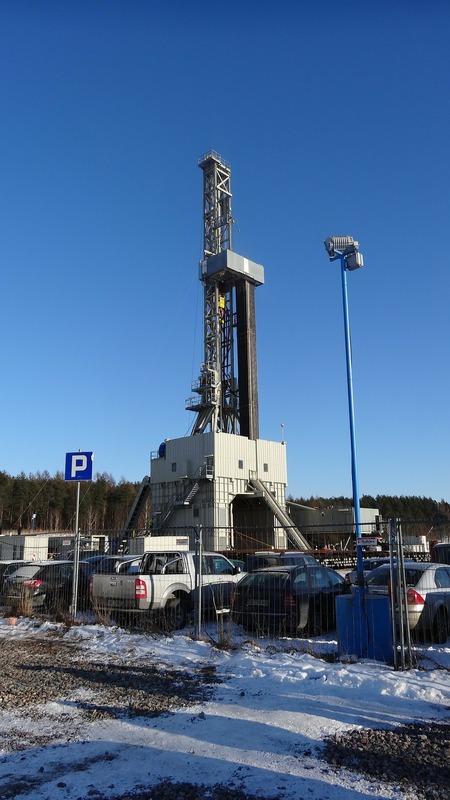 This work offers new scientific insights to help purify shale gas. The University of California, Berkeley, leads CGS.